Hey Mr. Base Man! 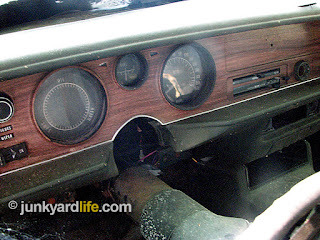 Let’s take a closer look at a couple of base model Firebirds from our files. Not to imply that we have had our fill of upper level Pontiac Firebirds, such as elusive Esprits, fiery Formulas, and titillating Trans Ams. We have a lifetime enchantment with those Birds, but this is a shout out to their lesser-feathered beginnings. 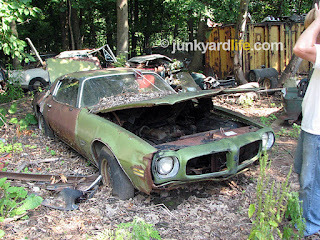 This green 1970 Pontiac Firebird was discovered by Junkyard Life staffers, me (Ron) and Anthony Powell, in one of our best junkyard excursions of all time. To express how great this place was, please consult a thesaurus because I just don’t have enough adjectives to describe walking into a junkyard that was closed to the public in 1975. This 1970’s Firebird coupe was one the newer cars there. This skinny Bird was as base as Area 51… or was it? See? They couldn’t even afford the entire emblem, much less the cavalcade of options they could have gotten. However, wait one more time. This very emblem indicates the car had at least one option. The Pontiac-based 350-V8. A look under the hood told us it had power steering. This rough photo above doesn’t say much… or does it? Tilt your glance slightly to the right, fellow Bird watchers, and note this car does have at least two more checks on the RPO order form. One option would be the console. You didn’t necessarily score one when you hatched your new Bird. Also, this bird has (had) a radio of sorts. A sharper eye than mine may be able to tell if it sang through an AM/FM combo or a meek and common AM unit. This car was also available with an 8-track tape player, but I don’t think Mr. Green Jeans here had one. 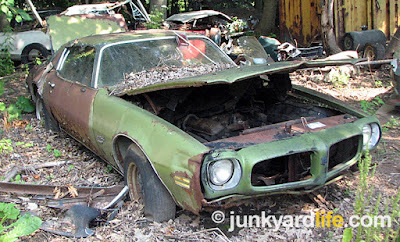 I am not sure the cigarette lighter was free with the car, but I have not seen a Firebird without the smoker’s friend. Also, don’t get excited about the 160 speedometer. 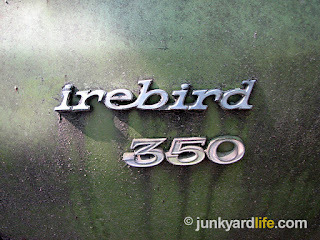 That was standard Firebird issue, but don’t look for this Bird to require one. Other than that, no Rally gauges, no AC, no delay wipers. Don’t gripe about the idiot lights, because you do indeed have a fuel gauge. Your welcome, Pontiac consumer. This car had another option! The color-keyed vinyl top! That was an option that wasn’t free. I know it could have been added on, after the fact, but I would rather think that it was born that way. Also note the “truck-like” winter tires mounted on older Keystone wheels. We did find this one in Pennsylvania, so we already knew it was likely driven in the winters. It was only five years old when parked here. A tough five years indeed. This was the trunk. A virtual treasure chest and time capsule for vintage bottle collectors. 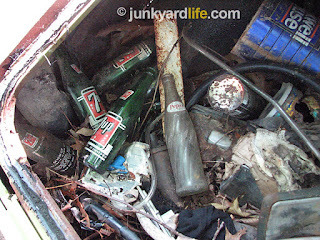 The junkyard owner was nice enough to let me take a couple. Not shown was a Dr. Pepper “10-2-4” bottle. Look closely and you can see the original green on the trunk jam. “Key Lime Green” otherwise known as paint code 43 was very appropriately named. 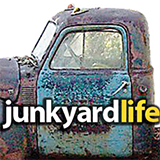 We love the details like paint and trim codes here at Junkyard Life. You know our weaknesses, and green Firebirds are at the top of the list. Sometimes, we love cars for what they are, and sometimes, we love them for what they are not. 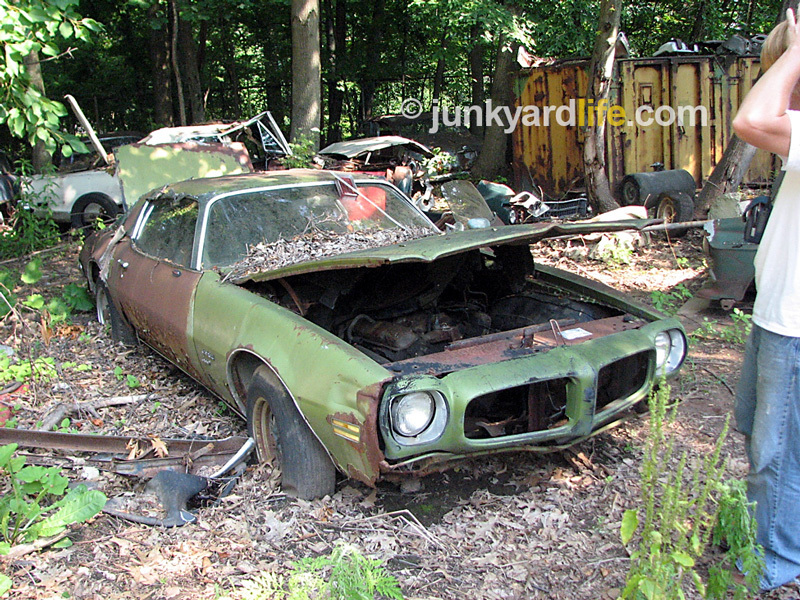 A great example would be this bottom-of-the-barrel, base model ’75 Firebird Coupe. To say this Bird was spartanly-equipped would be an understatement. This girl had no make-up, no spoilers, no power accessories, no air conditioning, and if memory serves, it did not have power steering. It did not have a V8 under the plain flat hood. 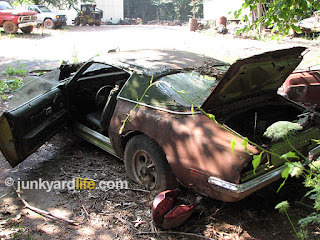 Still, this car with its humble and frugal beginnings should not have wound up in a parts yard. I wish we would have found this car years ago. It would have been practically free as a used car. It would have been a huge hit at the Trans Am Nationals and attracted a gaggle of Pontiac nerds like us. 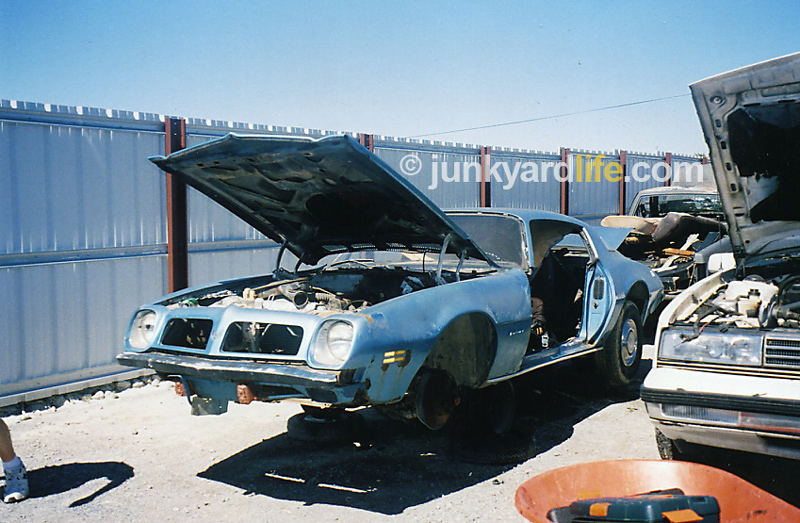 This blue 1975 Firebird had virtually no optional equipment and is the definition of an UnderBird. 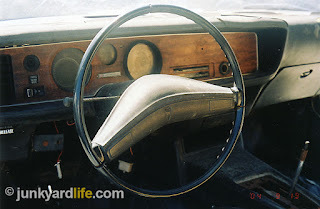 Pictured above is the strange steering wheel that I don’t recall ever seeing before. I mentioned that I did not remember this Bird having power steering. This may explain this odd steering wheel. The only thing this wheel had in common with the famous Pontiac Formula steering wheel is that they are both round. The only thing that keeps this Bird in line with anything resembling sporty would be the console shifted automatic transmission. Quite frankly I am surprised that it had that. I expected this base blue bird to be a manual three-speed. No, don’t be funny. Just for that, you can’t even have any type of optional rolling stock — enjoy your hub caps. Why pay for a Pontiac-based 350-V8 under that plain hood? Clearly, what you want is this nice 250 c.i.d. with only six cylinders and Bimini Blue paint. 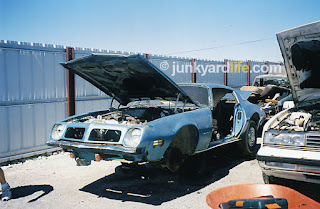 I took more photos of this blue Bird, that I found in a Georgia salvage yard, but it isn’t that I refuse to share them, I just can’t find them all in the massive archives of photos we have here at Junkyard Life. Sorry, I’ll keep looking! Base models are cool too, and we seem to have forgotten them in our eternal quest to collect Trans Ams, Esprits, and Formulas. So, let us not forget them any longer and consider saving an UnderBird. In this case, I wish I would have. 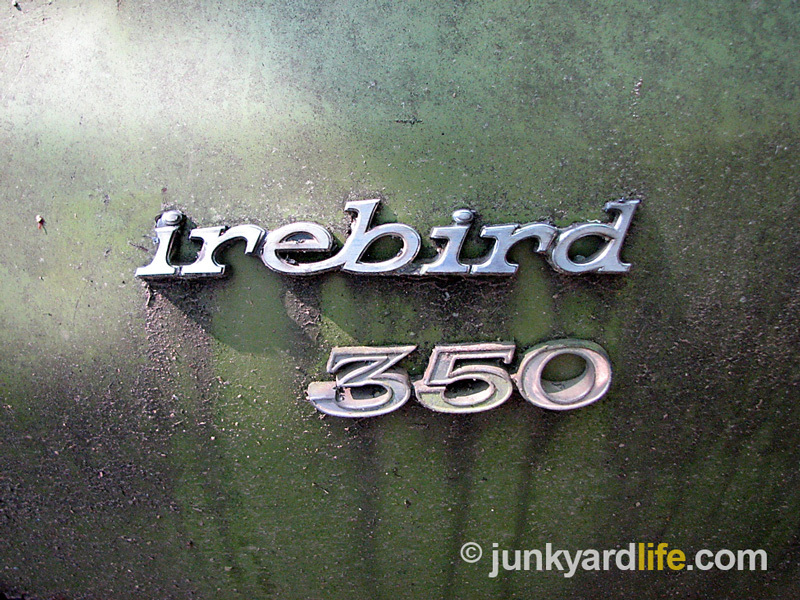 Is there a cure for the newly termed UnderBird Buyers Remorse? I think so. It can be treated with a base model Firebird — now, go save them!